How should Christians react to current intellectual thought and the new, often unsettling ideas that accompany it? 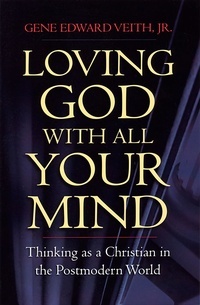 Gene Edward Veith, Jr., shows that Christians must address contemporary thinking—they can not only grapple with new ideas without compromising their faith, but Christianity provides a superior basis for pursuing knowledge than do competing worldviews. Our world is alive with fascinating new ideas, discoveries, and technologies. But for Christians this can also present problems—especially when the values of postmodernism and secular university life conflict with basic Christian principles. What should Christians do when their beliefs come under attack in the classroom or the public square? Loving God with All Your Mind shows us that the answer is neither wholesale rejection of intellectual life and culture, nor blind acceptance of it. The answer lies in understanding that Jesus is Lord of all of life and that everything in life must be carefully viewed in the light of what Christ’s lordship means. Gene Edward Veith unfolds a dazzling critique of the postmodern intellectual world and culture. He affirms the part that is good and true, but he also shows crucial weaknesses that have such a hold over contemporary thought. This book shows Christians how to survive and flourish in a postmodern world while affirming the truth of the Christian faith.